Done. It’s probably painfully sunburnt right now anyways. So! The book in the photo above was this years favourite Christmas present from my dad. Side note into adulthood – books make a fantastic Christmas present. I find a book I want, send the amazon link to my family and boom – they’ve got direct reference to what I want for Christmas. I could not wait to get home from all the festivities to dive into this book, and I truly read it cover to cover. 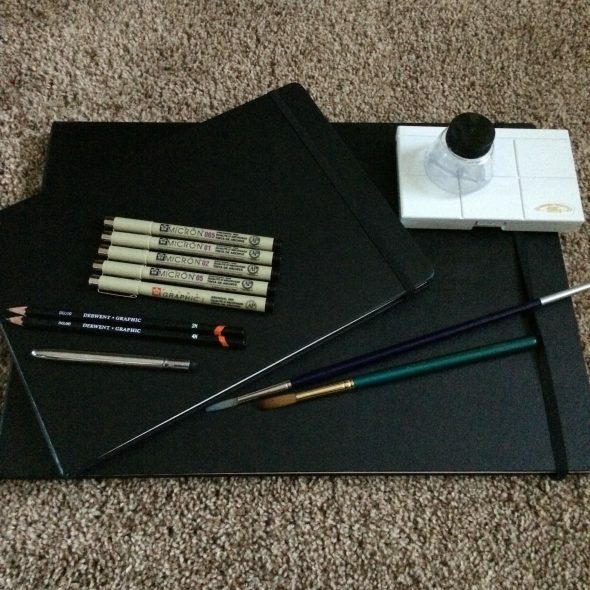 Not pictured is the little pencil case all of this fits into – aside from the brushes. My girlfriend Meagan gifted me this perfect little case that all of this fits into! The little white kit is the watercolour kit open and pictured above. I bought it at Inglewood Art Supply for about $60 – a bit of an investment but that was last April and the tins inside are still quite full of paint. Most urban sketchers I follow will refill the little pans with their own paint but I’m nowhere near empty enough to do that. As a side note – all of the watercolour paints I am using still are from a Christmas present from my mom when I was 16. I’m 32 (shh…) and started seriously painting about four years ago. Those tiny little tubes will last you forever. The pencils are 2H and 4H – so the lead is really hard which means they rarely need to be sharpened and the linework is so light that it almost never needs to be erased and will not muck up the paint overtop with excess lead. I carry the following sizes of Micron pens: .005, .01, .02, .05 and 1 – the one is quite solid and I use it mostly for framing drawings. I usually lean toward the .005 but I’m trying to get away from it. The more I work on this stuff the more confident the line becomes and it makes more of a statement using a thicker pen. 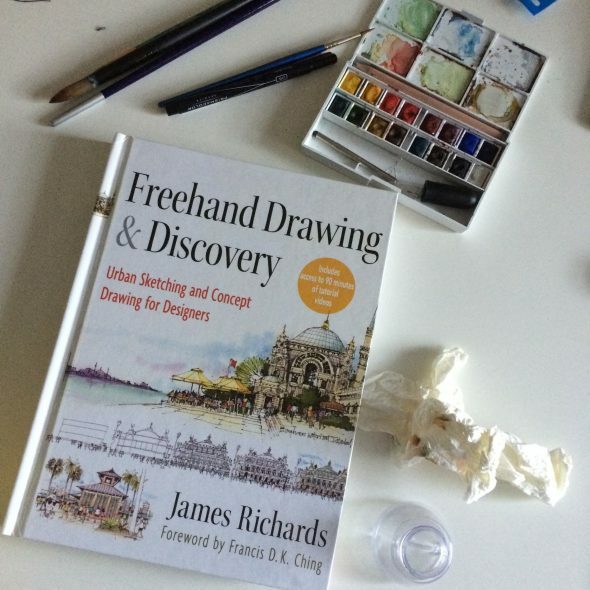 Funny too – on December 31st of 2014 I went to a Starbucks and spent the morning sketching. One of the notes I made that morning was to try using more ink as opposed to pencil. That transition is coming along nicely and I will continue to work on getting comfortable with going straight to ink in the new year. The two sketchbooks are Moleskine watercolour books. One is enormous – 12″ x 16″ so when open I could technically create a painting that is 12″ x 32″ – something I’m hoping to do at least once in Brazil. Copacabana beach anyone? And the smaller one is 81/2″ x 11″, so standard paper size. In previous years I’ve used loose sheets or watercolour blocks before finally going to sketchbooks last year. I really prefer the books – even though they’re different sizes, once they’re full I can write the dates and the book number (these two are three and four) on the front. I have cut sketches out of the other books I’ve completed to give as gifts, or I can scan the originals, but now I have this growing collection of works dated in chronological order…I can see my progress over time and it just speaks to my inner organizational freak I guess, hah! And a last minute addition to the kit. The author spoke about how as an architect he once prided himself on wheeling a two tiered cart into design meetings loaded up with coloured pencils and markers. However, he eventually realized that he was more hindered by the choice of which colours to use. I have been lucky enough in the past to get a few well paying illustration jobs, after which I rewarded myself with the full 120 piece Prismacolor Marker set, and the following year the full tin of 132 pencil crayons. They look impressive and are beautifully packaged – and as a result I have barely touched them. There was a full page spread with a list of the colours he now carries in his travel kit – which I have copied here. 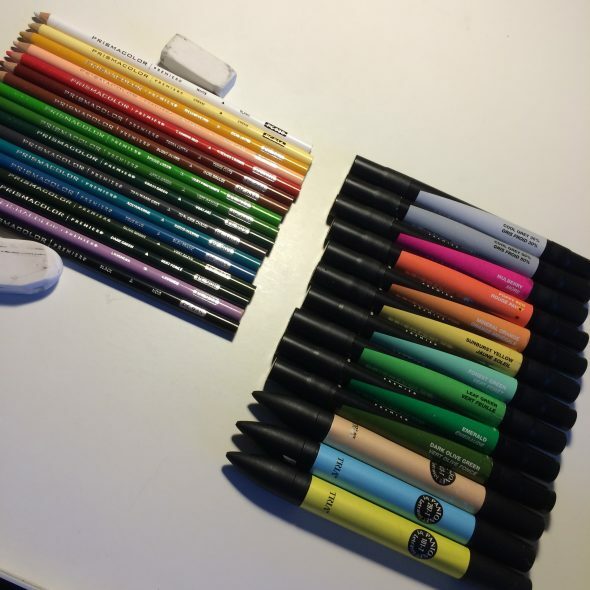 I can write out the list of colours if anyone is interested, but for now, these are the coloured pencils and markers that are accompanying me to Brazil. I hope they all come back a little worn down, proof that they have finally been put to good use. So that’s it! The travel kit in a nutshell. Fits nicely into a tote bag I received for Christmas and not too heavy! I hope by the time this blog post is published I have made excellent headway into both Moleskine books and have tons of new pieces to share. This entry was posted on Monday, January 18th, 2016 at 10:30 am. It is filed under General Musings, Travel Kit and tagged with moleskine, Musings, prisma markers, rendering, travel kit, watercolour. You can follow any responses to this entry through the RSS 2.0 feed.